The good news: the crop protection market is on the rebound. After two years of declines, in 2017, the global market grew 1.93% to a healthy $54.15 billion, and the picture for 2018 is promising, said Dr. Bob Fairclough, Director of AgriGlobe, Kleffmann Group, in his presentation at the AgriBusiness Global Trade Summit on Aug. 1. “To see positive growth is quite promising and sets the scene for going forward,” Fairclough said, adding that the seed market, which climbed 6.3% last year, is largely driving the mergers and acquisitions happening in the industry. 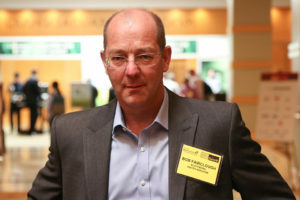 Fairclough said 2.5% to 3% growth for the crop protection market in nominal terms is a realistic target over the next five years. For continued recovery in 2018, there is a caveat, and that is the Trump Tariffs and its impact on commodity prices. Rebalancing of market share: Mergers have reshaped the industry. In the past, everyone was chasing the leader with only a 1-2% differential among the top players. One of the primary objectives of regulators is to try to balance the situation to create a more level playing field. All sectors (herbicides, fungicides, and insecticides) grew in 2017 over 2016 with the exception of plant growth regulators and fumigants. In Europe, there is the question of what will replace banned neonicotinoids – e.g., pyrethroids, and a potential entry of Dow’s sulfoxaflor into the market. Costa Rica was a standout market in 2017 on the back of fungicides for bananas and other plantation crops. Japan, meanwhile, suffered a difficult year hurt partly by policy – namely the strengthening of the Gentan System. On the flip side, re-registrations and entering the Japanese market have become much easier for generic companies. Ghana has also performed badly in recent years as it buys less pesticides to adjust its trade balance. Expect more in the way of Japanese consolidation (e.g., Sumitomo). Crop protection company sales look positive through the first and second quarters of 2018, posting “double-digit growth, which we haven’t seen for a long time,” Fairclough observed. The trend of sourcing both formulated and tech from India continues to grow. In 2017, the trend was distorted with the “environmental” price hike in China. Chinese sales of formulated products rose 33% in 2017 in value terms whereas overall volume rose only 12%. Under Trump, it’s getting easier (or not tougher) to get products into the U.S. market and to keep them there. In Europe, it’s exactly the opposite: Regulatory is getting even more restrictive and it has become trickier than ever to register and re-register products.